1. Put all the broth ingredients in a large stock pot or casserole. Cover them with cold water (about 3 litres) and place over a high heat. Bring to a simmer, skim any scum off the surface, then turn to the lowest heat and simmer as gently as possible (you want a few small bubbles coming up occasionally) for 35 minutes. Lift the chicken out and carefully cut away the breast meat (use a chopping board placed inside a baking tray to catch any escaping juices); cool the breasts, then chill until needed. Return the carcass to the pot and continue to simmer gently for 2 hours. Skim off any scum that rises to the surface throughout. 2. Leave to cool for 30 minutes, then lift out the remaining chicken. Strain the liquid into a large, clean pan, through a fine sieve lined with a double layer of kitchen paper; you should have about 1.5 litres. Discard the wings and aromatics. Place the pan over a high heat and bubble vigorously for 20 minutes to reduce; you should be left with about 1.25 litres. Meanwhile, shred all the dark meat from the carcass, discarding the skin and bones, then slice the breasts; set all aside. 3. Add the mushrooms to the stock and simmer for 5 minutes, then add the shredded dark chicken meat, soya beans, pak choi, soy sauce, shaoxing and mirin. Simmer gently for another 3-5 minutes. Meanwhile, cook the noodles according to pack instructions, then drain, rinse in cold water and toss with the sesame oil. 4. Squeeze the lime juice into the broth and check the seasoning, adding more soy sauce, lime or a pinch of sugar, if needed. 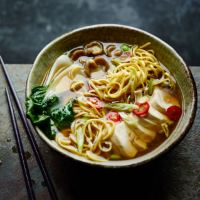 Divide the noodles and chicken breast between 6 bowls and ladle over the broth, shredded chicken and vegetables, garnishing with the salad onions and chilli.